Not to take anything away from anyone else, but I honestly think I have the best neighbors in the world. They are kind-hearted, generous of spirit, supportive, talented, and an absolute hoot to boot. When I asked my next-door-neighbors to the east of us if I could borrow their tree-filled back yard for a photo shoot, they generously obliged and even helped out with the 7-hour process. The lady of the house pitched in with styling the table, and the neighbors behind us came over to help with breaking it all down. Such sweethearts!!! After all that work, we deserved a good meal and a crisp, refreshing glass of September wine! Given the sultry temps we continue to experience in the Midwest, it’s hard for me to break out the pumpkins just yet. This late summer/early autumn tablescape (what I like to call “summer adjacent”!) has rich, deep hues tempered by creamy ivory in the full-length underlay, background of the overlay (a 6-yard length of fabric purchased from a remnant table several years ago), candles and other tabletop elements. No charger used here so as to allow more of the overlay design to show. Clear glass dinner and salad plates from Bed, Bath & Beyond are the perfect choice to do just that! Clear chargers – perhaps with a colored edge – would work great here if you have them. Click here to see another fun way to use clear glass plates. Two-tone cotton napkins from Pier 1 are folded to expose a generous portion of both colors thanks to my neighbor, Barbara, who also nailed the placement of the napkins on the plate. The menu is simply deep ivory lightweight cardstock embellished with grape clusters that pick up the pattern & color in the overlay. Leaves I plucked from Barbara’s sycamore tree resemble a grape leaf. Clear glass stemware for lots of wine tasting during dinner! Inexpensive all-purpose glassware can be purchased on sale at stores like Pier 1 or Old Time Pottery. Lightweight and versatile faux mother of pearl flatware from Target. 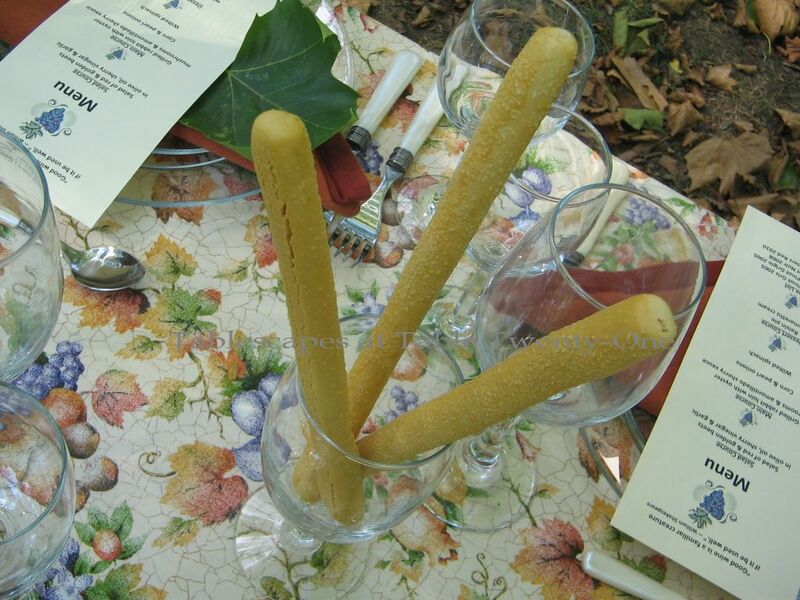 Breadsticks are displayed in clear glass stemware. The much-maligned clear glass hurricane sleeve is actually one of my best decorating friends. I have them in various sizes, and I find they can dress a table up in a heartbeat. Here a mix of 24″H and 17″H hurricanes from Pottery Barn create the desired high/low look. The 2 outside hurricanes are placed in huge metal-banded wooden bowls that are filled with fruits and a profusion of faux leaves that mimic the design in the fabric overlay. Centerpieces using fruit continue to be a favorite of mine for autumn tablescaping. (These black seedless grapes from Costco were inexpensive and SO tasty!!!) An ivory pillar candle elevated on a bronze candlestick provides a subtle glow. Click here for “Simply Bittersweet”, another table using varied hurricane sizes. A side table dressed in a full-length ivory linen holds pre-dinner party sips & nibbles. Flavorful cheeses are displayed under multi-sized cloches. 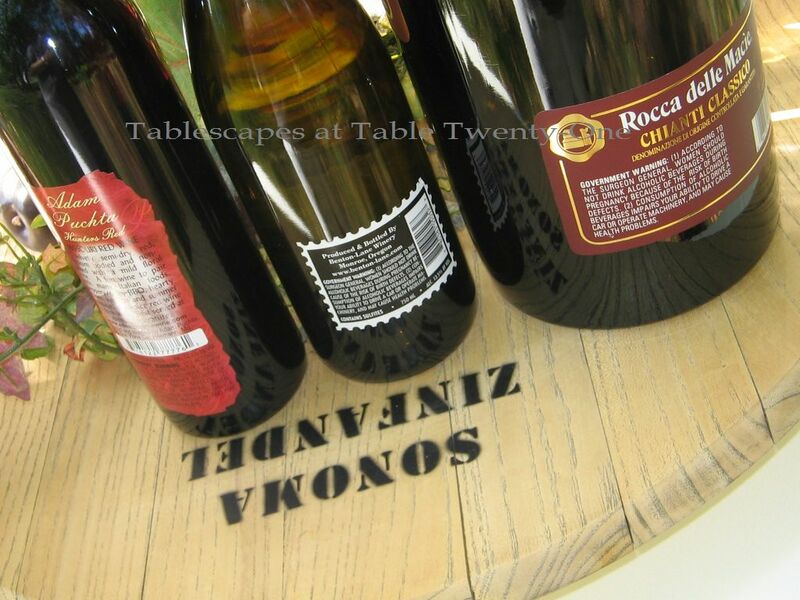 Wines are displayed on a wine barrel Lazy Susan from Pottery Barn. I like to think of different ways to display simple things. Loaves of crusty bread take center stage in an ivory-napkin lined stone urn. Suggested chairs for this table: dark wood chiavaris with an ivory pad. Check out “Brilliant Italian” for another wine-inspired tablescape! I’ll be joining Susan at Between Naps on the Porch for the 160th Tablescape Thursday, and I hope you will, too! Looks fantastic! What a great backyard. (This is totally an unbiased opinion!! REALLY….WHAT A GORGEOUS SETTING AS WELL AS CELEBRATION OF GRAPES AND VINO!!!!! LOVELY, GRACEFUL AND DELICIOUSLY DISPLAYED PARTNERS FOR THAT RED ELIXER!!!! THE BRIE IS MY FAV AND LOVE THAT IT IS PERFECT OUTDOORS!!!!! YOU KNOCK MY SOCKS OFF GF!!!!!! Eeee-gads!!!! You are good!!!! With all of this work, I’ll bet you’re planning a breakfast tray post next! I’ve always wanted to raise a glass of wine with you and this would be the perfect place to do so. I’ll bet that your neighbors love you as much as you love them. What talent you have. I just love this. WOW! Those are some huge hurricanes! My favorite piece is the urn with the bread and grapes….I love it! The fabric looks great- I like how it’s still light in color yet has the fall tones….breaking into the fall look gently! What time is the cheese and wine tasting? I’ll be right there! What a treat to have such wonderful neighbors! Aaaaahhhhh… How I love a wine party, and in the middle of a wooded area, covered in fallen leaves… ahhhh fantabulous!!!!!!!!!!! Thank you, Becky! They had the perfect backyard for this kind of dinner party! Hi, Barbara! Yes, we are back in the Midwest in Missouri with our old house and old friends and old neighbors…just the way God intended! 😉 Cooler weather is predicted for the next couple of days (highs only in the 60s), so maybe I’ll bow to fall a little more! Gorgeous! The leaves on the ground surrounding the tablescape are the perfect accent. I am in awe at how each table you post is more beautiful than the one before. You are truly blessed with a gift. Cheers! Thank you, ma’am! You are too, too kind! Isn’t that wild with all the leaves??!??! Their sycamores have been dropping them for awhile now. One of their trees has branches that extend over to right outside my office window, and it provides wonderful shade & privacy. These are very special and dear neighbors. Glad to have them! Outstanding Outdoor Tablescape, Alycia! All your beautiful accessories make it very interesting with both texture & sparkle. That had to be a great deal of work & I appreciate you sharing it with us & all your ideas, too. LOVE the bread standing up in the urn!! Good morning, Rett! I’m sitting here listening to some Englebert Humperdinck and just enjoying the cool weather. It DOES feel like fall this morning. I think it’s in the low 60s. LOVE it! So glad you like the ‘scape! Thanks for stopping by! You had me at wine…I SO love this! We are joining some friends for a tasting dinner at the end of the month so you have whet my appetite with your wonderful cloth, crusty baguettes & cheeses under your elegant cloches! What a beautiful tree lined spot for your table & what wonderful neighbors you have~ you even have a carpet of leaves for your September wine dinner! I hope you & your neighbors enjoyed the fruits of your labor with several glasses of wine after all your efforts & work! Good morning, Mary! It is so wild….my neighbors to the east are the only ones whose leaves are already so profusely dropping! He explained that it has to do with the type of sycamore. Well, it worked out perfectly because the leaves on our oak trees are still clinging for dear life! Enjoy your tasting dinner! Alycia – this is soooo beautiful, and it’s because the palette is so soft and relaxing. Your hurricanes are fabulous, the fabric on the table is perfect. I’d love to be invited to THIS party! This just takes the cake! Or maybe the wine, anyway, beeeeeuuuutiful!! You truly have the eye, my friend, and I so appreciate the hours it took to set this baby up. Now I wish I was close by so I could indulge in that luscious wine, cheese, and breadsticks!! And what nice neighbors you have to help!! Seriously, I love everything about this, the soft, soothing colors, the fallen leaves in such a gorgeous setting, the hurricanes, the glassware, the arrangements of fruit, leaves, I could go on and on, it is truly magnificent!! Thank you! Thank you! I’m so glad you like it. It was truly a labor of love. We have now polished off the wine and have one measly little cluster of grapes left over! I’m so glad you stopped by to see the latest. We had fun creating it! Oh goodness…what a beautiful setting, and table. I absolutely love the bread in the urn, and cheese in the cloches. I too love unique ways of displaying things. Great job, Alicia! Thank you, Miss Tanya!!! Your burlap would make a perfect pairing with that urn!!! What a perfect transitional table, Alycia! I can look at it and pretend temps didn’t climb back into the 90s here yesterday! I love the overview that shows the table surrounded by fallen leaves. My favorite element (among so many) would have to be the loaves of bread and the grapes swaddled in napkins and displayed in the stone urn. The colors and the variety of textures create wonderful surface interest and really draw the viewer into the fall (I mean summer adjacent!) fantasy you’ve so masterfully created! Hi, Bill, and thank you! Y’know, it’s funny how things come about. That stone urn was sitting nearby awaiting a plant to go by my front door. I was looking for something to put the bread in, and voila! Again…troubled times have forced my creativity hand! I’m sorry the temps have climbed back up there. We have a sunny, breezy 70 today! 🙂 I have been out in it a good part of the afternoon just soaking up the sun. I hope it moves your way soon. The bad news is that we are expecting a low somewhere in the upper 40s tonight. WAY too soon for that mess!!!!!!! Thanks for popping by! This is the third time today I’ve looked at your Summer Wine tablescape, and No, it isn’t that I’m sipping wine and forgot what I was doing. 🙂 This is so pretty I don’t know where to start. Oh, never mind those who “poo poo” the hurricanes. I agree that they are fabulous not only visually, but for practicality as well. I love the large size and your use of the fresh grapes. But the thing that really knocks my socks off, is the urn with the bread and grapes in it. Awesome! Thanks for stopping by with such sweet and encouraging comments. Oh my Alycia!! I love love love this table and setting! Wow! Very lovely fall feeling. I notice the leaves are already hitting the ground. I looked for a long time for the flatware at Target but never found it other than in red. I like the tall pedestal mini covered cake plates and hurricanes. Rats! Y’know, it seems to me like Target has stopped stocking its tabletop section as abundantly as they used to. What’s up with that??? I do wish I would have bought some of the flatware in red, though. Yes, the leaves are already on the ground in my neighbor’s yard. They have a special kind of sycamore tree that sheds early. They provide incredible shade, though, in summer!!! Hi, Christine, and thanks! I DO have nice, nice, nice neighbors who take such good care of each other. It’s wonderful! We have moved back to Lee’s Summit. Savannah was not for us after all. We are glad to be back where our neighbors love us and we love them!!! Beautiful setting for your stunning table, Alycia! It has finally cooled off…I think fall is finally peeking around the corner here in east central Kansas! Yes, indeedy!!! We woke up to temps in the 40s this morning. Yowza! THAT was a shock to the system!!! We’re headed to Pittsburg, KS (now THAT place is “in the middle of nowhere!! !”) this weekend, and I hope it doesn’t rain…at least not while we’re driving. I’m not much on driving in the rain. I’m glad you like the table! Thanks for stopping by!!! Wow, what a lovely setting! and what a lovely backdrop indeed! Girl, I am drunk on the beauty of your table. All of the elements you used are incredible. Love the use of the urn, bringing one into tomorrow and rework it, I had to leave your post to head over to Pottery Barns’ to look for the hurricanes I couldn’t find them, I’m now pouting.. You never fail to disappoint girl, I’m going back for another tour to drink in more of your beautiful tablescape. Thanks to your neighbors for lending the serene setting. O.M.G. This one is for the record books! The urn with the loaves and grapes is right out of a magazine; Veranda or some other classy glossy. Your ‘scapes just keep getting better and better. I’ll bet your neighbors are glad you didn’t move to Savannah! what a gorgeous setting and table, you had fun fun fun! I want that table set up on my back deck, with the bread in the urn and the cheese under glass! So pretty. Your outdoor settings these past few weeks have just made me want to sit at your table. How glorious. It will be a shame to have to move back inside. Hi, Jacqueline! I am going to HATE it when the weather gets so cool that I can’t create outdoors! 😦 Fall is so great because it offers cool enough temps with just the right amount of sunshine. I now think those Floridians and Californians may be onto something! 🙂 Have a great weekend! I think your neighbours are the lucky ones! It must have been fun for them to witness your creative talents and see the fabulous display that transpired! I have never seen such big hurricanes and just love how you’ve dressed them up! The cheese in various domes/cloches looks so classy and all the more tasty! Love the bread in the urn too! The tones and textures you’ve used along with the terrific outdoor setting really do make this tablescape seem like a transition from summer to fall – love the “summer adjacent” term! This looks amazing — and I never use that term, thinking it to be overworked and trite. But it certainly fits here. Just gorgeous. I love everything here….and what a wonderful setting at your neighbor’s place…especially the urn with the bread, etc. This reminds me of the grape harvest tables here in Italy (I’m still here until tomorrow)! Hi, Lana!!! Thanks for taking the time to pop in before you leave Italy! Oh, man….I wish I could just once experience what you did over the past few months! When I stop being a big chicken, maybe I will! 🙂 Travel safe, and we’ll look forward to seeing you after you recover from the shock of being back here! Bye! Terrific, Alycia. It’s great to have you again sharing your wonderfully creative tables. This one is a real winner! Thank you, Linda!!! Thank you so much!!! I am thrilled to be back! You set a beautiful table – so many pretty details! Oh my…what an awesome setting! LOVE the hues in this. Alycia — you always set the MOST amazing tables! This is autumn perfection. Love the wine and cheese — the bread….good neighbors….a beautiful day…..PERFECTION! Hi, Martha! Thank you!!! This may be the last “amazing” table for a long time to come. This bad boy wore me out!!! 😉 Have a fabulous weekend, and thank you for coming by to see me!!! Alycia, your tables always make me wish I was one of the invited guests! This is another winner. Your hurricanes surrounded by fruits and leaves are just fabulous. I love that flatware, too! It all looks so inviting. Hey, Tammy! Thank you! Please know that if you are ever in the Kansas City area, you are automatically invited!!! Have a great weekend, and thanks for stopping in! The Autumn theme with leaves, wine, etc sure turned out nice as can be. Good morning, Deanna, and thank you very much! ALYCIA! This is gorgeous! I love outdoor dining! Thanks for stopping by….and you should give Pinterest another try! Good morning, Kerry! It just won’t let me do it (Pinterest using Internet Explorer! Someone suggested something about Firefox, but I have no idea what that is, and Explorer is what’s on all of our computers. I’m going to try again. I tried contacting the Pinterest people, but no answer thus far. Thanks for popping in! Glad you like the setup! This is amazing!! The glass plates make the tables look so BIG! KUDOS….Just Beautiful! Good morning, and thank you, Susan! Alycia, This is the best outdoor setting!!! I love it! Would be very, very happy to be invited to such a fantastic wine dinner…just beautiful! Wonderful step into Fall. It is gorgeous! 7 hours? OMG. I would need a nap in between. I don’t drink, but that wouldn’t stop me from dining at this lovely table. And who know hurricanes are out? Now tell all the peeps who spray painted their solid brass things …brass is back! I’m just getting to this, and I just love the whole thing. I scrolled through several times taking in all the details. I just kept thinking “abundance of plenty” as I scrolled. I would love to walk up to a table like that. And I love the use of the glass plates. I loved them on your daisy table, and do so here too. I need to get some clear plates! Hi, Debbie! I was really slow getting around to all the posts this past week, too. We were out of town, and I had to use my husband’s pokey ol’ laptop. It was so slow!!! 😦 Oh, well…c’est la vie! I’m glad you like this table! Those glass plates are a wonder!!! I use them for a lot of dinner parties simply because of the versatility they offer. A couple of friends of mine pooled their efforts and bought me a set of 40 dinner plates and 40 salad plates a few years back from Bed Bath & Beyond. Knock on wood, not one has been broken yet! 🙂 They are great for entertaining large groups! If you have an Old Time Pottery near you, I have seen them there for little of nothing. They also still have them at BB&B, I think. Thanks for stopping by! This is a magnificent table~ could have been set for a wine inspired wedding! Just breathtaking! Every detail is perfection. From the tablecloth to the stunning trio of big hurricanes nestled grapes and fallen leaves! What a statement! Cloth napkins are an everyday luxury for me. I will have to hunt down those 2 toned beauties for my own table. The menu looks luscious and I see you carried the grape/wine theme right through the food. Not only did you set a dining table, but a buffet that is overflowing with food, libations and beauty too! This table is one of my all time favorites. Thanks for the HOUR and HOURS that went into it so we can enjoy it! I would be so honored to dine here! Alycia, please stop by StoneGable…. you are the winner of the English Transferware giveaway! Congratulations! I’ll make sure Nancy contacts you with the gift certificate info. Oh, my goodness! Thank you for your wonderful comments, Yvonne! I so sppreciate it! And I am thrilled to be the winner of the English Transferware!!! Wow! After the horrible year I have had, it is an extra special treat to finally feel like a winner! 😉 Thank you so much!!! Thank you, Pinky!!! I passed your note on to my neighbor so she’ll know how much you liked it! She was a huge help!!!!! As you read, this was a 7-hour job to set up, so her help was invaluable to the process!!! This tablescape is absolutely stupendous, Alycia–You are the Fairy Godmother of all tablescapes–wave your wand and out flows gorgeous! And you make me laugh over at my blog 🙂 A woman after my own heart you are, Alycia! Your salads sound wonderful. I love blue cheese as well, and love to do my apple salad switched out with pears and blue cheese–that’s really tasty, too. I hope you have a mah-velous weekend, dahling! This is absolutely gorgeous…..I’ll bet your clients were very disappointed when you retired, so glad you share with us! Beautiful.